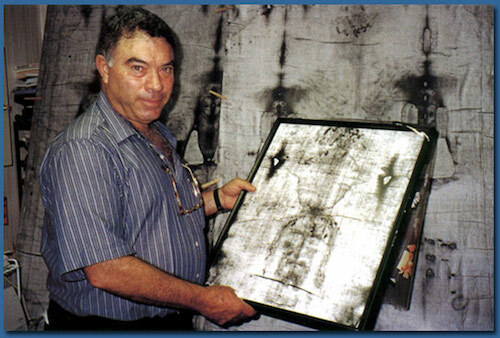 “Sindonology” from the Greek word sindon meaning “muslin sheet “is the scientific study of the Shroud of Turin. The Shroud of Turin is an ancient. sepia-colored, rectangular, 14.3 x 3.7 foot linen cloth woven in a three-to-one herringbone twill composed of flax fibrils with the front and the back image of a naked man with his hands folded across his groin on it. The Shroud is currently in the Cathedral of Saint John the Baptist in Turin, Italy. 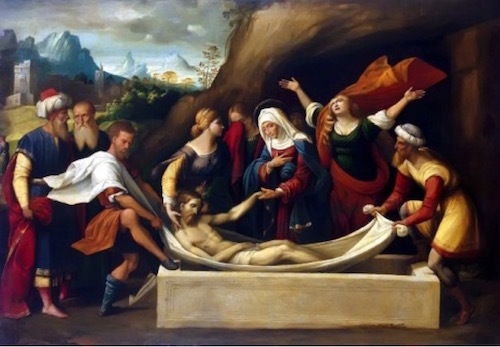 Entombment of Christ, Garofalo 1520—Grafalo had perhaps seen one of the exhibitions of the Shroud in order to paint its long dimensions and have known the fact the body was wrapped as they are doing in the painting. Details on the image of the Shroud could not be adequately discerned until a miracle happened. 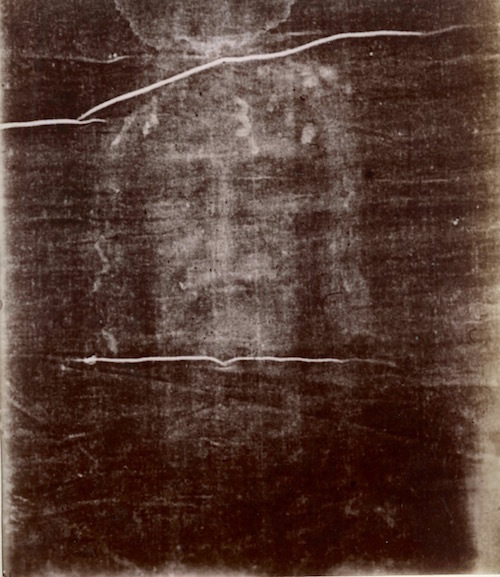 An Italian lawyer and amateur photographer named Secondo Pia (1855-1941) took photos of the Shroud during a rare public exhibition of it in 1898 (see below). When he developed the film, he jumped back. 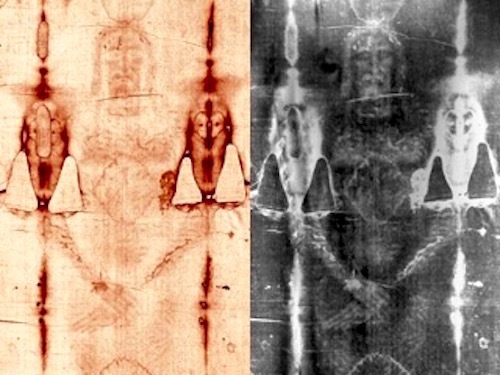 The photographic negatives of the Shroud fleshed out all the features of the man on the Shroud. Scientists and technicians took note and have studied the Shroud ever since. 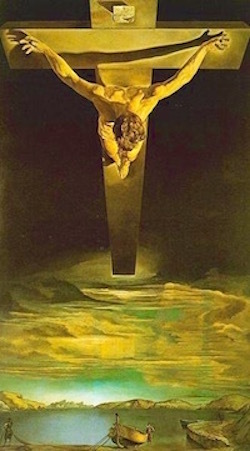 Some have concluded it is the true burial shroud of Jesus. Others have pronounced it a medieval forgery. But in 1978 a noted Swiss criminologist, Dr. Max Frei, took sticky tape samples from the Shroud lifted up from the fibers and found—POLLEN GRAINS. Enter into the pollen/floral discussion two Israeli professors: Botanist Avinoam Danin of Jerusalem’s Hebrew University who published nine books on the flora of the Middle East and Dr. Uri Baruch, a palynologist (science of pollen and spores) and authority on Israeli antiquities. Avinoam and Baruch found that of the hundreds of floral patterns and pollen grains found on the Shroud twenty-eight of them are from plants still growing in Israel and 70% of them are found in the area from Jerusalem to Jericho (e.g. Gundelia tournefortii, Zygophyllum dumosum, Cistus creticus, Capparis aegyptis). 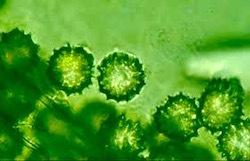 Half of the floral images and pollen grains from the plants are found only in the Middle East or other similar areas but never in Europe, the favored location of the forgery of the Shroud. There were, also, small images of flowers on the Shroud. A flower seen in a clear image on the chest area of the Shroud is of the Zygophyllum dumosum species (left). 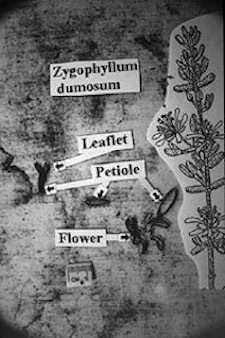 The leaflet, petal and flower of Zygophyllum on the Shroud are highlighted in black. According to Dr. Danin, the botanist, the plants Gundelia and Zygophyllum only coexist in a small area bounded by the lines linking Jerusalem and Jericho in Israel and Madaba and Karak in Jordan. 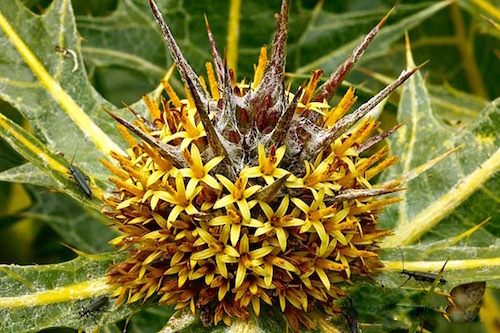 “This combination of flowers can be found in only one region of the world,” Danin stated. “The evidence clearly points to a floral grouping from the area surrounding Jerusalem.” The two scientists are convinced from the pollen and floral patterns on the Shroud that the Shroud originated in Israel.